The Boundless Thicket: Can Citrus Fruits Prevent Strokes? An apple a day may keep the doctor away but what can an orange a day do for you? Recently, the Journal of the American Heart Association published a study that claims that citrus fruits, such as oranges and grapefruit, may lower the risk of stroke in women. As a pre-med student, this information intrigued me. If this information is true, I am curious as to what is it about citrus fruits that prevents strokes? To what extent is this prevention? But first, before I dig for details about citrus fruits, it is important to know what a stroke is exactly and what causes a stroke. A stroke, also known as a cerebrovascular accident (CVA) occurs when blood flow to part of the brain is interrupted. This study looked specifically at ischemic stroke, where the blood flow interruption is caused by a blockage (usually a blood clot) in the arteries of the brain. When this happens, blood flow to part of the brain is decreased, causing damage to that part of the brain due to lack of oxygen. If this blockage is not detected and treated quickly enough (within 3 hours of onset), the tissue in that part of the brain may die. This may cause permanent brain damage or even death. It has long been known that risk factors for ischemic stroke are those related to the risk factors for developing blood clots and include: high blood pressure (hypertension), high blood cholesterol levels, diabetes, obesity, smoking, and alcohol and drug use, among other things. Therefore, it has been suggested that the key to stroke prevention is a healthy lifestyle and diet, which includes regularly eating a sufficient amount of fruits and vegetables. In the recent study published in the Journal of American Heart Association, Dr. Aedin Cassidy et al. conducted a 14-year study of 69,622 women from the Nurses’ Health Study in order to track how dietary intake related to stroke risk. But what, specifically, did they measure? 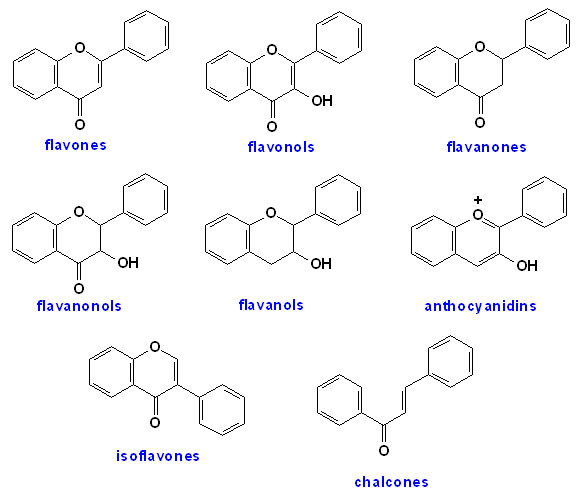 Flavonoids. Don’t know what that is? I didn’t either, so I looked it up. 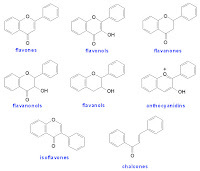 Flavonoids are secondary metabolites found in plants, meaning that they are organic compounds produced in plants that are not directly involved in the plant growth or development. They do, however, have several important functions in plants and are especially important for flower pigmentation. In humans, when ingested in the form of fruits and vegetables, flavonoids are most commonly known for their antioxidant activity. Antioxidants are molecules capable of preventing the chemical reaction known as oxidation, which transfers an electron or hydrogen atom from one substance to another. While some oxidation reactions are necessary for life, the prevention of other oxidation reactions is good because in some cases oxidation can produce free radicals (atoms, molecules, or ions with unpaired electrons). Because having an unpaired electron causes a molecule to be in a highly unfavorable state, these free radicals can cause unwanted chain reactions in a cell that can cause damage or death to the cell. This cellular damage can contribute to diseases such as heart disease, cancer, and many other health problems. Along with having antioxidant properties, flavonoids have also been shown to improve blood vessel function and have anti-inflammatory effects. Because these are all properties that could contribute to stroke prevention, Cassidy et al. measured the dietary intake of different sub-classes of flavonoids along with overall flavonoid intake of the women in the study and how it related to stroke risk. In order to measure flavonoid intake, Cassidy et al. surveyed 80,332 female nurses, beginning in age range 30-55, every 2-4 years with diet, lifestyle, and medical history questionnaires. To make sure they were using correct information, the questionnaires were carefully screened to exclude incorrect or implausible answers. This left 69,622 women participating in the survey for the next 14 years. Flavonoid intake was measured according to their relative amounts in fruits, vegetables, wine, tea, and other food sources and divided into the 6 main subclasses of flavonoids commonly consumed in the U.S.: flavanones, anthocyanins, flavan-3-ols, flavonols, flavones, and polymers. 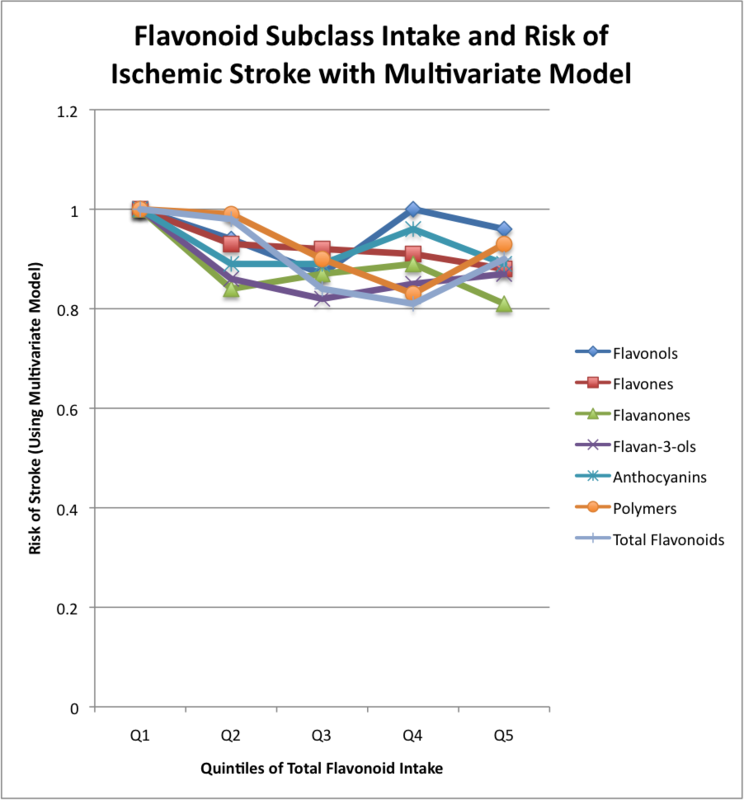 Then, after assessing flavonoid intake and occurrence of ischemic strokes over the 14 year study, Cassidy et al. created a multivariate model (see chart below) which took the stroke risks associated with each class of flavonoid intake and adjusted them for age, physical activity, smoking, hormone replacement therapy, body mass index, aspirin use, Type 2 diabetes, hypercholesterolemia (high cholesterol levels), history of coronary heart disease, alcohol, menopausal status, energy, use of multivitamins, and history of hypertension (high blood pressure). Interestingly, the study found no correlation between overall flavonoid intake and a lowered risk of stroke. 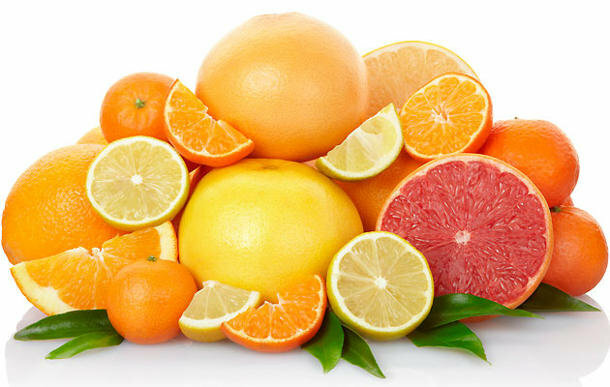 They did, however, find that women with the highest dietary intake of the subclass of flavonoids known as flavanones (most commonly found in citrus fruits such as oranges and grapefruits) were 19 percent less likely to suffer ischemic stroke than the women who consumed the least flavanones. These results mean that while overall flavonoid intake does not reduce the risk for stroke in women, an increased consumption of citrus fruits increases the levels of flavanones, which may reduce women’s risk of stroke by up to 19 percent. This graph correlates to the Multivariate Model constructed in the study. As you can see, the Flavanone subclass (green) had the lowest risk of stroke with the highest intake. How significant is this 19% reduction in stroke risk in the grand scheme of things? Researchers today acknowledge that there really is no one factor that determines probability of stroke, but instead stroke risk is determined by a multitude of factors. According to an article published in 1997 in the journal Stroke by the American Heart Association, there are several risk factors for stroke that are non-modifiable, such as age, race, gender, and heredity and several that are potentially modifiable such as lifestyle factors and use of alcohol or drugs. According to the article, “the realization that the probability of stroke is increased severalfold by the presence of multiple risk factors may help both patient and physician to more fully appreciate the need for serious risk factor management.” Relating this back to my previous findings, this article specifically means that because there are so many of these potential risk factors that may contribute to the probability of a stroke, no one factor, such as daily fruit intake, can independently entirely reduce a person’s risk for stroke. Lifestyle changes like increasing daily fruit intake, however, can potentially reduce one risk factor for stroke meaning that a person may have one less risk factor and therefore a decreased chance of stroke occurrence. Although these substances have not yet been directly tested in humans, animal studies have shown that: hesperidin has anti-inflammatory properties and reduces blood pressure; naringin was found to lower estrogen levels, lower cholesterol levels and have antioxidant effects; and eriocitrin has strong antioxidant effects. These factors all support the plausibility that flavanones may have a beneficial effect in stroke prevention, enhancing Cassidy’s conclusion. While these studies provide an interesting correlation between increased flavanone intake and reduced risk of stroke, there is still need for further studies of flavanones. These results, which I do believe are significant and can possibly be an important insight into the future of medicine, do not yet prove for a fact that flavanones directly prevent strokes, nor do they indicate the molecular basis of the observed benefits. It is important that this is understood and these results are not misinterpreted; eating citrus fruits alone will not directly prevent or treat strokes and further studies are needed to assess just how much effect they have on lowering stroke risk. However, if nothing else, this study does support the need for a healthy diet full of fruits and vegetables and a healthy lifestyle in order to lower the risk for stroke, with some extra emphasis on citrus fruits. So, next time you grab for a citrusy snack remember these potential health benefits. Your article is very detailed and informative. It seems like the whole study was based on women and mainly revolved on the effects of citrus fruits on women's health. So out of curiosity, I wonder whether or not citrus fruits could help to lower the chances of strokes in males too? Other than that, I think you did a really great job of explaining everything. I don't really like to eat oranges as such but after reading your article I think it's something I should include in my diet. Solid topic. You did a great job starting with a very pertinent topic and breaking it down to a chemical level. 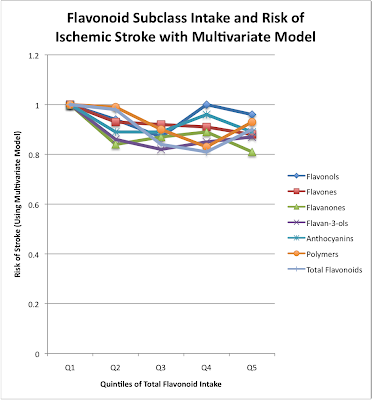 Looking at how chemically similar some of the subclasses of flavonoids are, its crazy that flavanones were the only ones that showed a correlation between their increased intake and decreased stroke risk. It would be interesting to see how exactly flavanones prevent free radical formation in ways that the other flavanoids do not. Is it a difference in the mechanisms themselves, a difference in the rate at which they inhibit radical formation, or both? I was very intrigued by the topic of your blog post. I have always been interested in the health benefits of eating certain foods. Additionally, my family has a history of stroke, so I found your post informative. One thing I questioned while I was reading was how much of a correlation could really be proven between consuming flavanones and reducing stroke risk. I just kept wondering if there could be some other compound present in the fruits that was actually responsible for the effect, because the researchers did not really do anything to isolate the variables. However, you did a great job in raising those doubts at the end of the paper in order to keep the claims more accurate. Overall, great job in explaining the organic chemistry behind it (especially with the antioxidants and the oxidation reactions, along with their consequences). Interesting to see how much this relates to concepts we've learned in class!